Cities are birthplaces of civilization; centers of culture, trade, and progress; cauldrons of opportunity-and the home of eighty percent of the world's population by 2050. As the 21st century progresses, metropolitan areas will bear the brunt of global megatrends such as climate change, natural resource depletion, population growth, income inequality, mass migrations, education and health disparities, among many others. 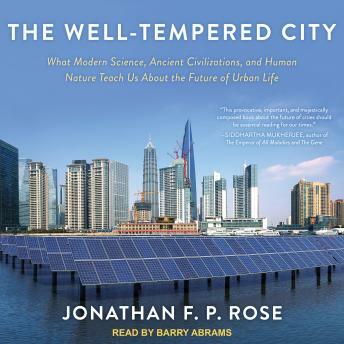 In The Well-Tempered City, Jonathan F. P. Rose-the man who "repairs the fabric of cities"-distills a lifetime of interdisciplinary research and firsthand experience into a five-pronged model for how to design and reshape our cities with the goal of equalizing their landscape of opportunity. Drawing from the musical concept of "temperament" as a way to achieve harmony, Rose argues that well-tempered cities can be infused with systems that bend the arc of their development toward equality, resilience, adaptability, well-being, and the ever-unfolding harmony between civilization and nature. These goals may never be fully achieved, but our cities will be richer and happier if we aspire to them, and if we infuse our every plan and constructive step with this intention.